Frequently moving your mouse to keep your system awake is annoying, right? What if you don’t move the mouse for a bit longer? You need to enter your password again to login to your PC. This seems to be even more annoying. To pull you out of that annoying state, few programming geeks have built software for you to keep your system awake, without your intervention. Using these softwares, you can relax keeping your PC aside, without bothering about your PC logging off. Thus, you must know about these cool Mouse Mover Software now! Such software is Mouse Mover Software that moves your mouse at specific intervals without user awareness. It makes the CPU believe that the system is currently in use, by making movements at specific intervals for a particular frequency. Here are 10 best mouse mover softwares that are available for free for all Windows users. Move Mouse is an automatic mouse mover that keeps your PC awake even when not in use. 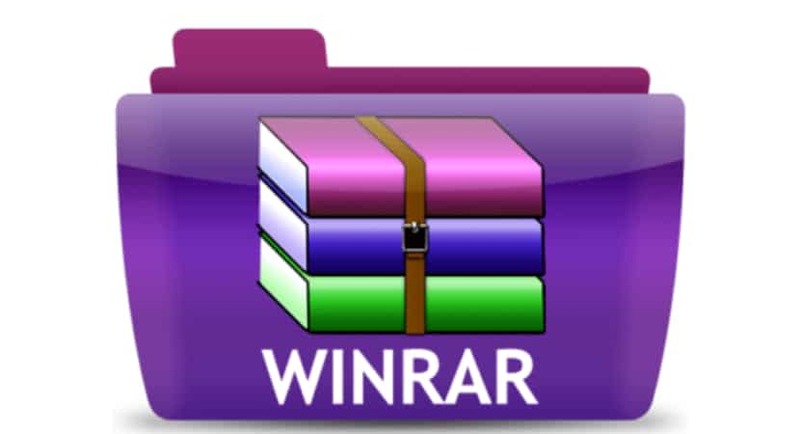 It has extensive features that give you complete control over the working of the software. You can set the seconds interval, which makes the software wait till that number of seconds to pass, before its next movement. You can enable stealth mode to make the action invisible on the screen. The software is activated and starts counting seconds to move the cursor as soon as the application is launched. It automatically minimises the Move Mouse dialogue box when not required. It has many more exciting features to explore and make the best use of the application. 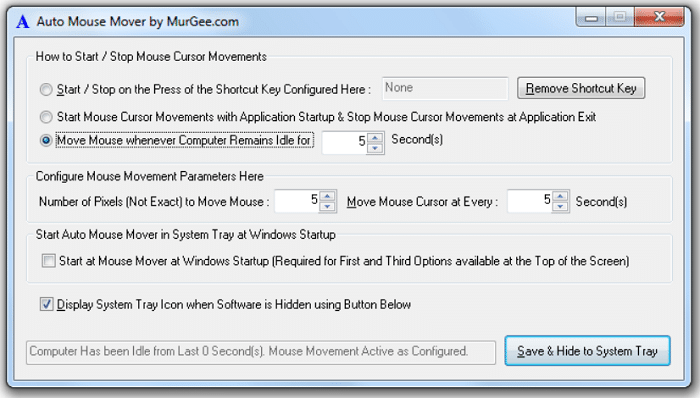 Mouse Mover generates a mouse movement every 5 minutes. You do not have to set any time intervals or frequency. It keeps the PC alive from the moment it is launched till it is shut down. 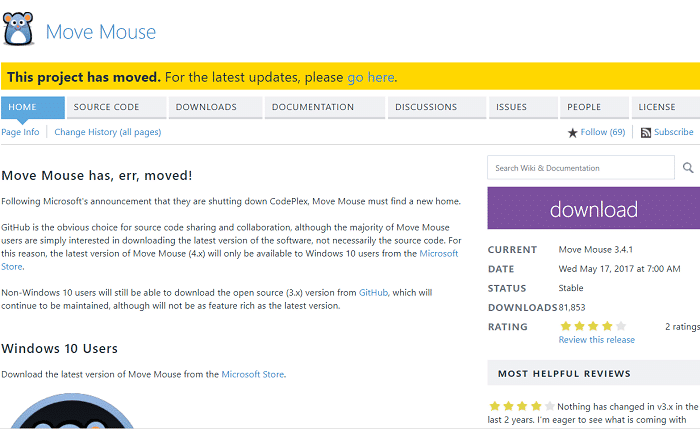 Mouse Mover is so simple that you do not have to follow lengthy procedures to tackle the software. 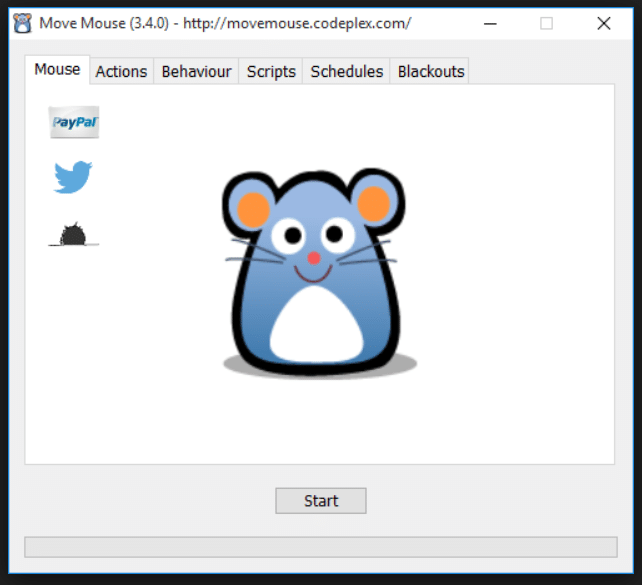 This Mouse Mover Software has a simple window, only to end the program. No settings, no configuration, and no massive overheads. Just launch the application, and the software takes the best care. It is a lightweight and user-friendly application which comes free of cost. Auto Mouse Mover is an application that follows automation to prevent your system from logging off. You can enter the desired interval in the application dialogue box, and your software works accordingly. You can also specify the pixel rate which helps the software to move accordingly. It automatically minimises the application window when not necessary on the screen. You can maximise it later when you require the window on the screen. Tiny Task is a simple utility to automate repetitive tasks. Just record your task and feed it to the software. It performs that task multiple times according to the intervals you provide. It is a simple and has an unambiguous interface that is easy to use and minimise your efforts. Now wave a goodbye to annoying repetitive work and join hands with the software. 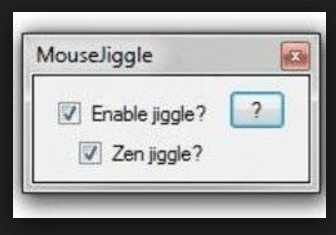 Mouse Jiggler, jiggles the mouse to prevent your system from logging off. It is a dedicated mouse mover that moves the mouse when the system is not in use and fakes an input to the CPU to remain awake. Mouse Jiggler is simple and easy to use with user-friendly interface. This Mouse Mover Software works as a best saviour to give you some rest while working on installations or any other extended essential operations. The software is free and has been rated well by the users. Give yourself a break while working, by using the software and lessening your efforts on your work. Mouse Machine has come with extraordinary features of automation of mouse movements. You can input the coordinates and choose an action, on which the software cling to and works accordingly. Not just movements, it can also perform clicks when configured as per your requirement. It keeps your system awake, do simple operations like click or double-click or move to specific coordinates on the screen. With its various activities like a mouse, it is termed as a Mouse Machine following automation of mouse operations. 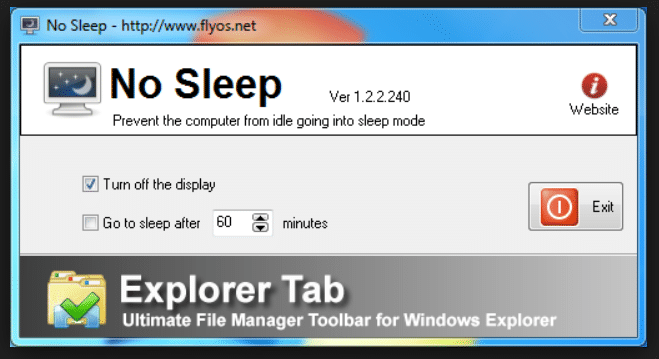 NoSleep as the title itself explains is a mouse mover that prevents the PC from going into the sleep mode. 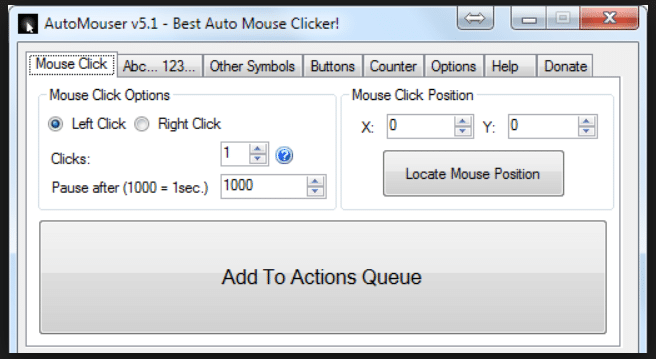 This Mouse Mover Software moves the cursor to a pixel left and a pixel right every 30 seconds which gives the CPU a sense of using the computer without being left idle. This is a movement not visible to the human eye as it is a very precise movement which only a CPU can grasp. AutoMouser is a mouse as well as a keyboard automation tool. It has got above 100 features to configure and control your software as per your requirement. You can automate your mouse movements, mouse clicks, and keyboard clicks by setting up the configurations. It has been rated and reviewed with many positive feedbacks that made the software stand among the top 10 mouse movers. 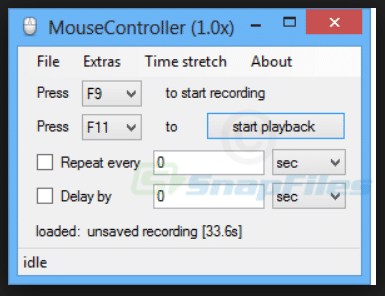 MouseController is lightweight and freeware utility that allows you to record a task and feed it to the software to perform an automatic and repetitive task that is recorded. Shortcuts keys are available to record and playback. It is highly customisable and supports execution from a command prompt with legal parameters. 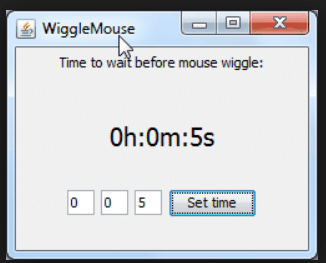 Wiggle Mouse is a simple software which has a sole purpose of moving the mouse at specific intervals to prevent the system from sleeping. It is a cross-platform Java program which takes intervals as input from the user through the Graphical User Interface. You can work with your system without interruptions or logoffs due to longtime inactivity. The software pretends to use the computer on your behalf by making simple movements.